Day Two at the Self-Reliance Expo was packed with activities, absolutely packed, and so I didn't get as many photos as I hoped. 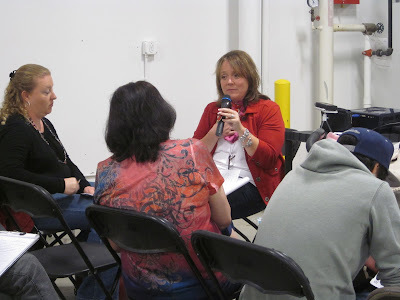 I started out doing a BlogTalkRadio interview with Wilson from Pantry Paratus. It was challenging to accomplish this -- the acoustics in the Expo hall were too bad, so we went outside to a quiet courtyard, but then it started raining; so we moved to a covered area in the courtyard and continued the interview, but the wind picked up (which interfered with the microphone); so we tried using a small room off the Expo hall, but the RedShed folks were conducting another radio interview; so we finally removed ourselves to Wilson's car in the parking lot, which worked like a champ. Whatever it takes! The biggest commitment of the day was the Panel Discussion involving the "Women of Prepping." This consisted of (left to right) Jackie Clay, Nurse Amy, myself, Lisa Bedford and Kellene Bishop. As you can see, the setup on the stage was wonderful -- comfortable chairs for the speakers, a table for our notes, etc. 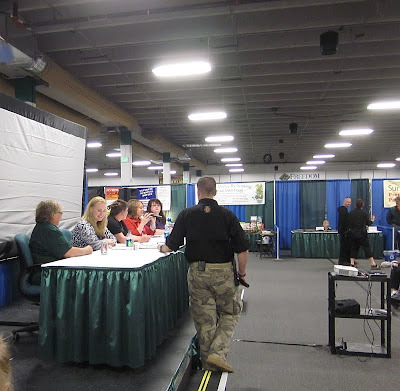 The Panel discussion lasted two hours, and it passed in a flash. In fact, we ran out of time. We had five questions (submitted in advance by readers on the Self-Reliance Expo Facebook page) and theoretically had five minutes to answer each one. Yeah right. 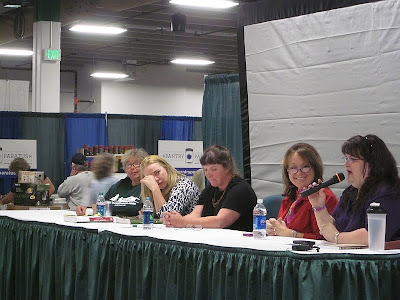 As Dave Duffy (from Backwoods Home Magazine) later joked, you get five women together and five minutes per answer was much too short a time. All jokes aside, he was right. The questions that had been chosen for us were picked out of a pool of 600 questions submitted by Expo readers, so it was an enormous task for the Red Shed Media Group to sort through them all and select representative questions for each of us. It hardly did the questions justice to limit ourselves to five minutes, LOL. And in fact we ran out of time, so in the end each of us only had a chance to answer three out of the five questions, with a few minutes to take questions from audience members. 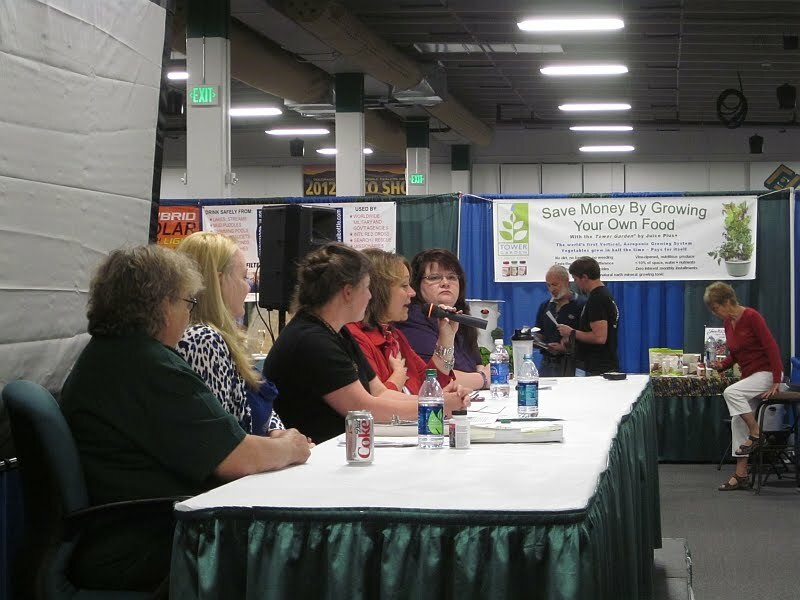 The topics we discussed were very diverse and based on each of our particular specialties, which included firearms and self-protection, finances, homeschooling, home businesses, medical issues, and canning/homesteading. From the expressions and reactions of audience members, it seemed the information was very well received. And after the discussion was concluded (we had to vacate the stage on time because Nurse Amy had her hour-long discussion on medical subjects immediately afterwards), we came down and all of us became involved in additional conversations with various people who had more questions and were looking for more information. I had to stop and photograph this booth because of an interesting coincidence. It just so happened I ordered some heirloom sugarbeet seeds from these folks just last week. (Before I left for Colorado I got a notice the seeds had shipped, which means they were shipped within a day of my ordering.) Imagine my surprise to see these folks at the Expo! 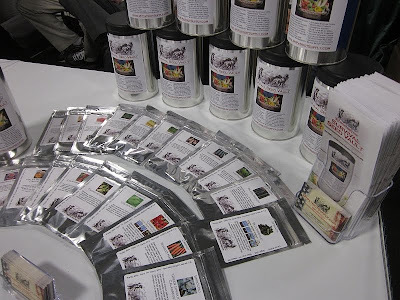 They sell, among other things, heirloom seeds vacuum-packed for long-term storage, so I stopped and told them I was impressed with their customer service. This is the empty booth for the National Geographic Doomsday Preppers show, which was there to cast participants for the next season. I stopped and chatted with this representative for a few minutes, which turned out to be quite interesting. She said casting for the show was obviously the most challenging part. I said that from a Prepper's perspective, it's because (a) no one wants to blow their OpSec, and (b) no one wants to be portrayed as if they're wearing little tinfoil hats. We have recordings of some of the episodes from the last season a friend made us. Don and the girls have watched them but I haven't seen them yet. I told the woman that my understanding is that the people portrayed in last season's series were a little off the deep end (please understand this is second-hand reporting) but to their credit, National Geographic was NOT attempting to paint all Preppers with a tinfoil brush. In other words, they were making every attempt (to paraphrase Fox News) to be fair and balanced. The Nat Geo representative was grateful and said the trouble with casting is it tends to attract people at the extreme ends of the bell curve. This, of course, means the largest number of Preppers -- the everyday teachers, dentists, doctors, crafters, housewives, electricians, waitresses -- in short, just ordinary folks -- who have concerns about the economic future of our country, get lumped in with the extremists; and then people conclude all Preppers are wearing tinfoil hats. As I said, it was a short but very interesting conversation, and I'm glad I stopped and spoke to her. I wished her luck with the casting and genuinely hope they are able to find people who are more "mainstream" (for lack of better term) in their representation of Preppers. Again throughout the day, I had the privilege of meeting a number of readers who stopped by, and in fact I remained in conversation with several for a couple of hours following the Panel Discussion. I also gave my second talk on Moving Rural for Self-Reliance, which brought others forward to discuss options for leaving their urban environment and relocating to more rural areas. Lots and lots of good "vibes" and interest from so many people! The one overall comment I heard several times from independent sources (attendees, vendors, speakers) is the positive atmosphere of the Expo. The people who came, came because they wanted to. The booths were very busy with people gathering information and making purchases and learning things. 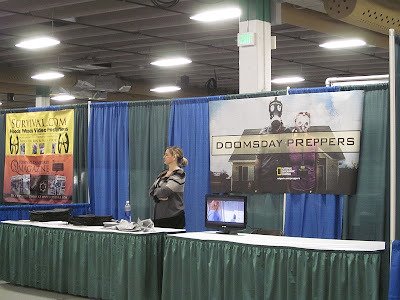 Sometimes Preppers are portrayed as doom-and-gloomers, but I assure you that wasn't what I saw. Here's an amusing anecdote related to me by Nurse Amy on Saturday morning as we had breakfast in the hotel. It seems Friday night she and her husband had gone to dinner, and her husband had forgotten to remove his tag from the Expo. In the restaurant they were accosted (or is that too strong a word?) by a couple who peppered them with preparedness-related concerns and they stayed in discussion with them for about half an hour. 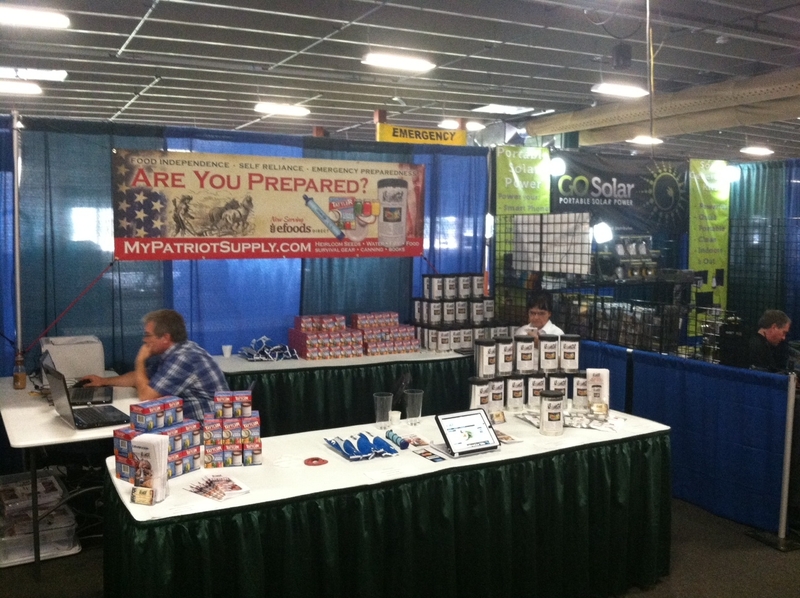 The couple didn't realize a Self-Reliance Expo was in town and so promised to come the next day. The couple thanked Nurse Amy and her husband for their time and departed... whereupon another couple in the booth behind (who had been listening with perked ears through the entire conversation) turned around and said, "We're Preppers too!" They also hadn't realized the Expo was in town and made plans to come the next day. Amy is an amusing speaker, so I laughed as she related this experience and I said Preppers are coming out of the woodwork. Anyway, by the end of the day and all the booth break-down, I was pooped but exhilarated. 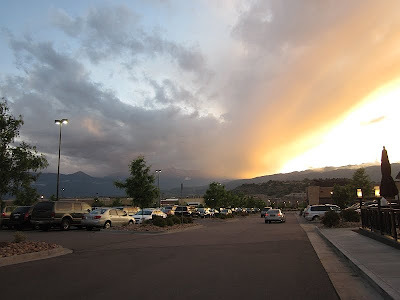 I joined Lisa Bedford and her delightful family for dinner and saw this beautiful sky as we entered the restaurant (first time I'd been outside all day!). I can't thank the producers of this Expo enough for the privilege of participating. What an extraordinary experience it was! Thanks for the description! I'm sure I'm not alone when I say I wish I could have been there. Your account of what happened to Nurse Amy gives me hope that maybe more people are aware and are prepping than I thought. I hope so. It does my heart good to read this...in more ways than one. And I'm sooo glad you got to attend. Now to see how long it takes for the hidden camera footage to appear on doomsday preppers...! What..? Me???? Cynical??? How do ya figger? Those long-term packaged heirloom seeds look mighty interesting. I'll look those folks up. Thanks Patrice for once again walking point for so many of us and bringing back all the valuable info. Your panel was wonderful and gave me a lot to think about. It was great talking to you afterward --thanks for taking the time. I hope you had a great time in Colorado! Well, horse feathers. If I'd of known. I would of stopped and said "HI!" My wife and I were at the expo. It is the first one I have ever been to. And We look forward to others here in Colorado. It was fun, and we came away with tons of info. I'm still reading things, then it will be the wife's turn. I had the fantastic opportunity to take Nurse Amy and Dr. Bones class in the Dallas Expo on suturing. It was absolutley hilarious fun. They were both funny and engaging. She had to keep in line on microphone holding techniques. What a blast to meet them. Hopefully you can make the Dallas Expo if it comes back to Texas. Sadly, I can't... I would LOVE to go but I have a prior commitment at a selling venue that weekend. I'm hoping to be invited to additional future events, however.